The First Issue of US revenue stamps was released between 1862 and 1871. 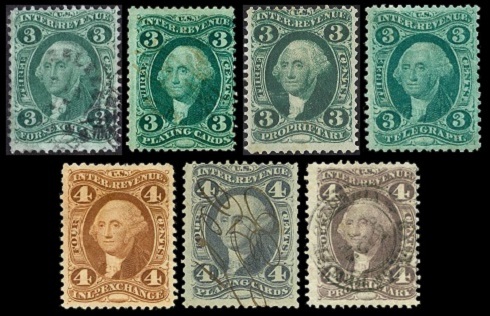 These stamps were finely engraved on old paper, and they all feature the portrait of George Washington. They were produced in four formats, with the three most important formats being described in the column to the right. The colors stated in the catalog detail tables are the "issued colors", as described in the Scott Catalog. 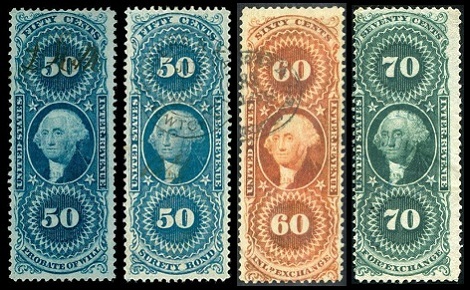 Many of these US revenue stamps were printed from unstable pigments, and their shades can vary tremendously from stamp to stamp. Until December 25, 1862, the law stated that a revenue stamp could only be used for payment of the tax on a particular document whose name was inscribed on the stamp. 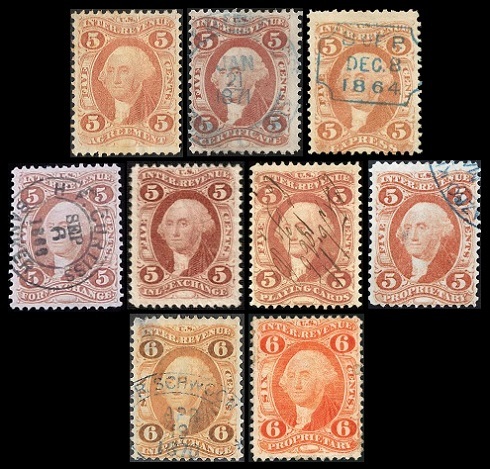 After that date, these US revenue stamps could be used indiscriminately on any document, regardless of the document name inscribed on each of the stamps. The First Issue can become a philatelic specialty in itself! 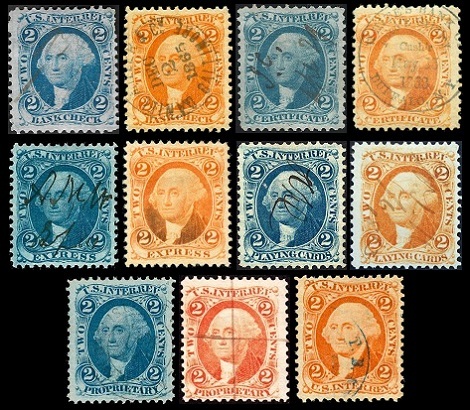 The Scott Catalog lists 103 major stamp types for this series. 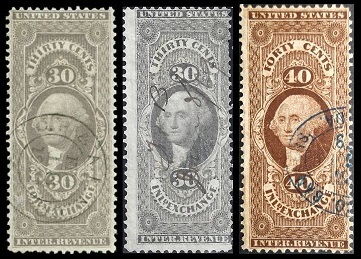 If one were to collect each of these US revenue stamps with their listed separation formats (which most specialists do), then that brings the total for this series to 232 stamps. 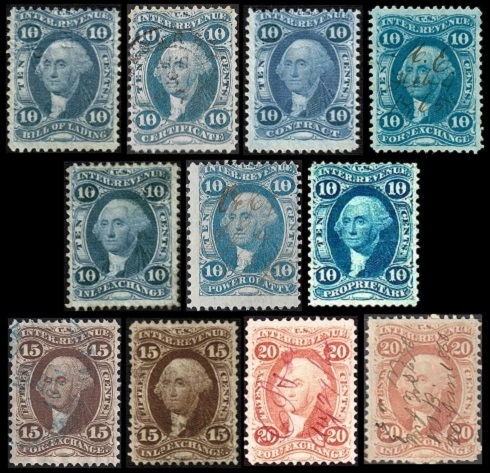 Add proofs, plate errors, paper varieties, maybe a study of hand-stamped and script cancellation types, and possibly a few examples on original documents, and the number of US revenue stamps required for specializing in this one series could be staggering! 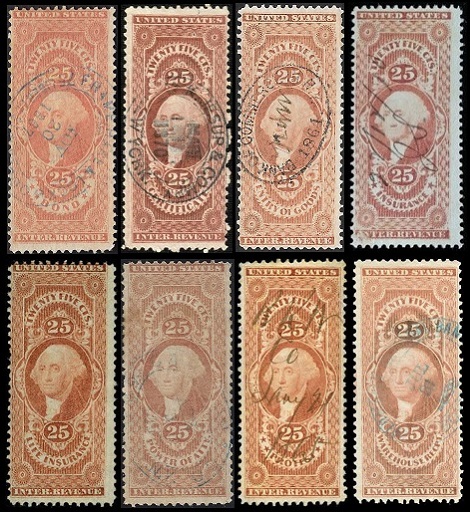 Many of the later, perforated 12 US revenue stamps of the First Issue exist on paper with silk fibers. Most of them range from scarce to very rare. 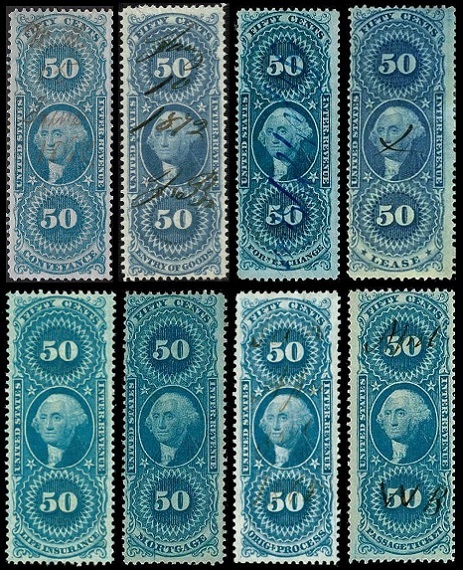 Perforated 12 revenue stamps with silk fibers are notated by the catalog number suffix "d" in the Scott catalog. Refer to the Scott Specialized Catalog of United States Stamps for details. The first issue of US revenues was initially printed in imperforate sheets. From the earliest days of US postage stamps, the sheets were usually cut into horizontal rows, and they were dispensed by either tearing off the individual stamps from the horizontal strips or cutting them off with scissors. Imperforate revenue stamps will be notated in the catalog detail tables by the catalog number suffix "a". To make sheet separation a bit easier, some of the imperforate sheets were part perforated vertically. The sheets were still cut into horizontal rows of stamps, but the vertical perforations made the individual stamps easy to separate. A few, though not many, of the first issue revenue stamps were also part perforated horizontally. Part perforated revenue stamps will be notated in the catalog detail tables by the catalog number suffix "b". The last, and most common, sheet production method was perforated 12 on all sides. The perforation 12 gauge had been utilized for all US stamps since 1861. Perforated 12 revenue stamps will be notated in the catalog detail tables by the catalog number suffix "c". All the stamps shown in the images at the left are separation Type C.